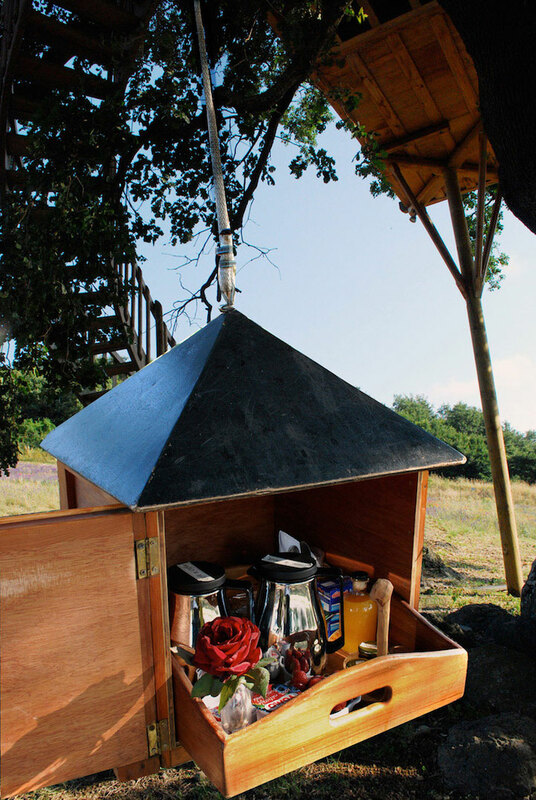 Wake up to the scent of fresh lavender wafting 26 feet from picturesque blue-purple fields to the deck of your own private treehouse retreat, your breakfast delivered in a pulley-operated birdhouse. 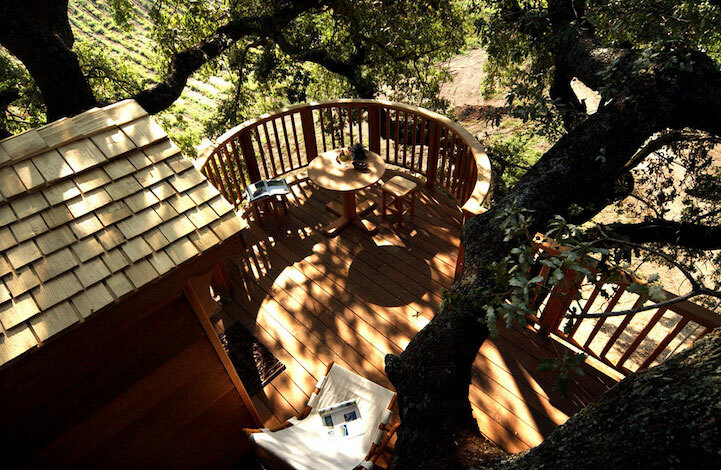 Suite Bleue at La Piantata Hotel in Arlena di Castro, Italy is nothing short of a dream, surrounded by almost 30 acres of organic herbs growing in orderly rows for a private atmosphere yet just a short walk from the main hotel facility. 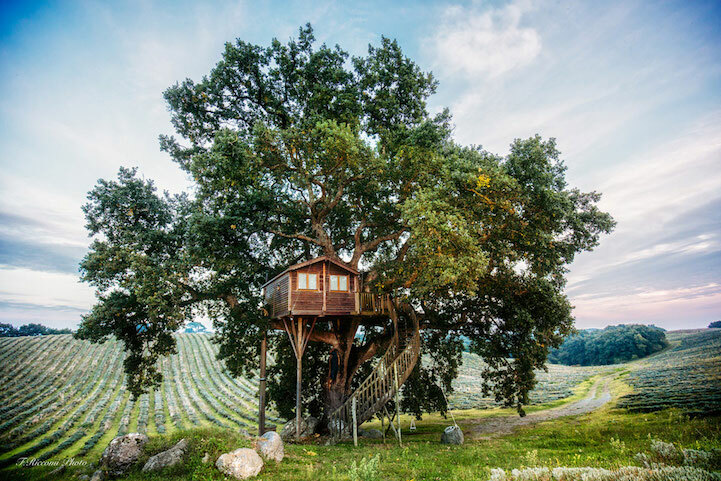 The owners fulfilled their childhood dream in commissioning treehouse architects La Cabana Perchée to create the getaway in the boughs of a stunning century-old oak tree. 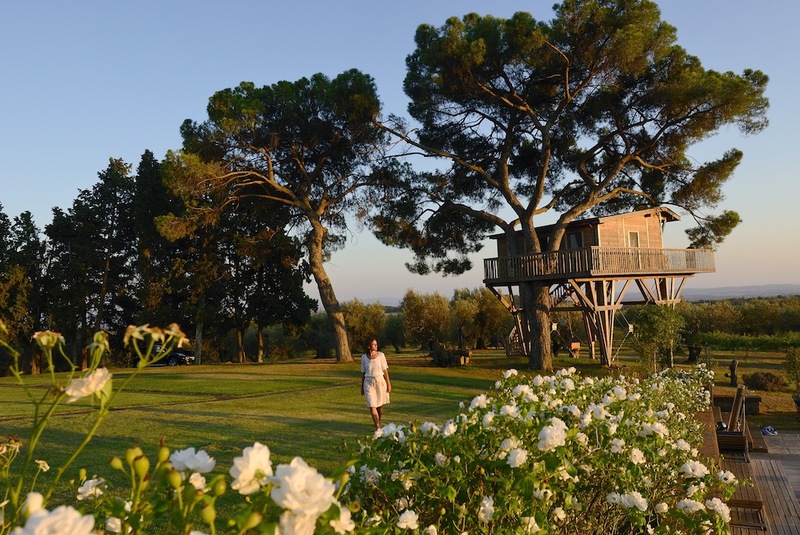 Just off in the distance are an olive grove and a second treehouse known as the Black Cabin, a ‘glamping’ experience with a more modern aesthetic overlooking the hotel pool. 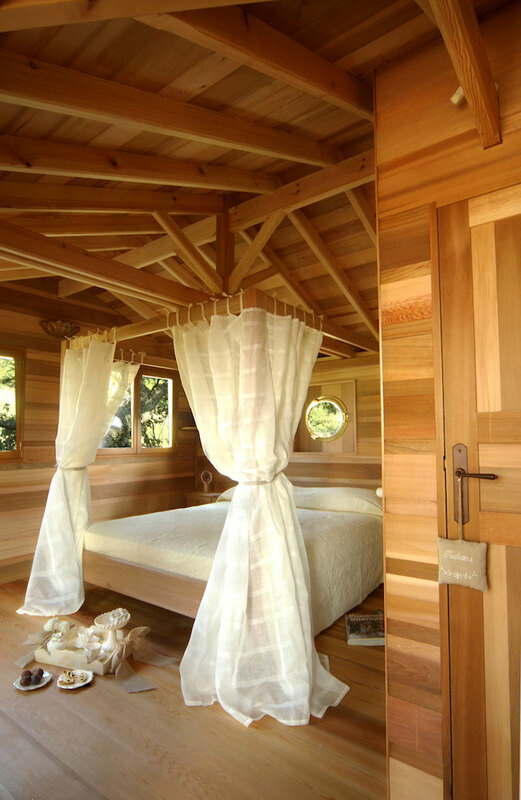 Where the Black Cabin is refined, with high tech amenities and luxurious glass and steel finishes, Suite Bleue is as rustic as any treehouse you might have enjoyed playing in as a child. 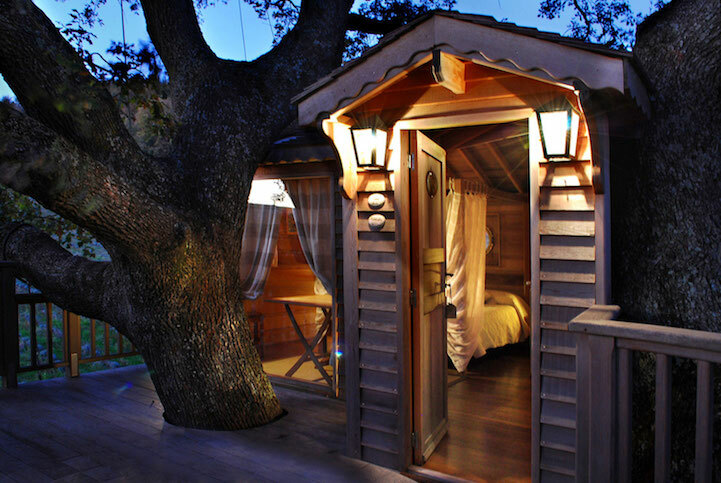 The double bedroom with its four-poster bed overlooks a terrace shaded by the oak branches, where you can enjoy your meals in the open air. 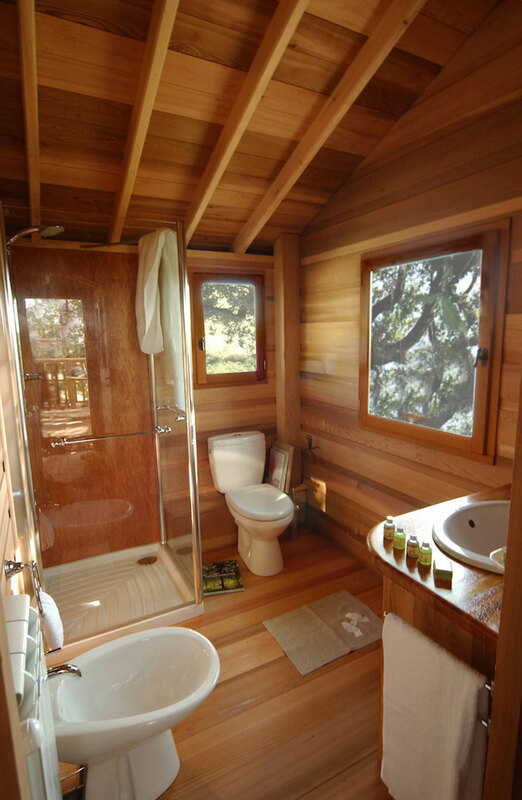 There’s champagne in the fridge, and unlike many treehouse resorts, this one has its own private bathroom, complete with a shower. 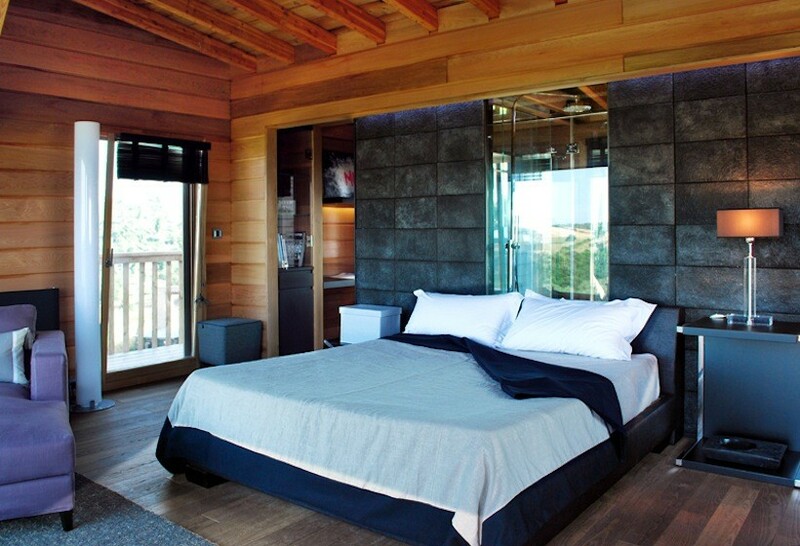 The Black Cabin (pictured above) is described as ‘ultra-luxe,’ with an interior designed by Claudia Pelizzari of Archiglam Studio with lots of mirrored finishes,black steel, Corian and crystal contrasting the natural cedar cladding and linen textiles. There’s a flat screen television with a Bose home theater system, heating, air conditioning and views of the Sea of Tarquinia from the terrace. 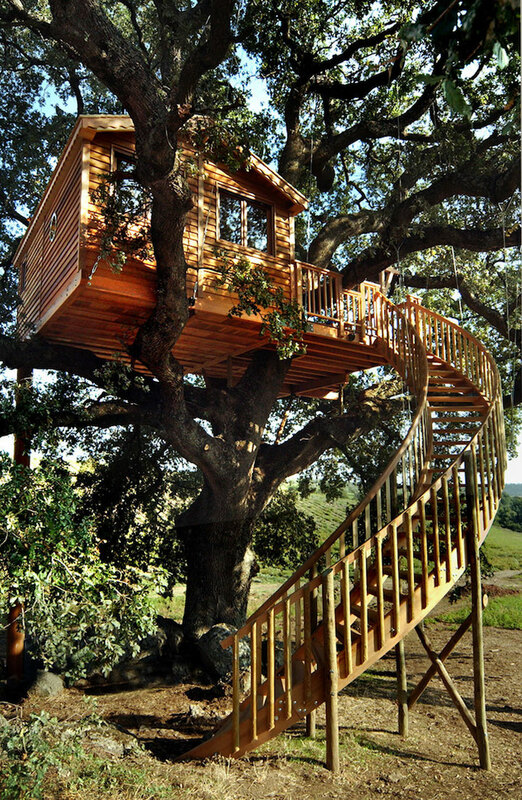 This treehouse is carefully built into a 200-year-old maritime pine with self-supporting stilts to avoid harming the tree. 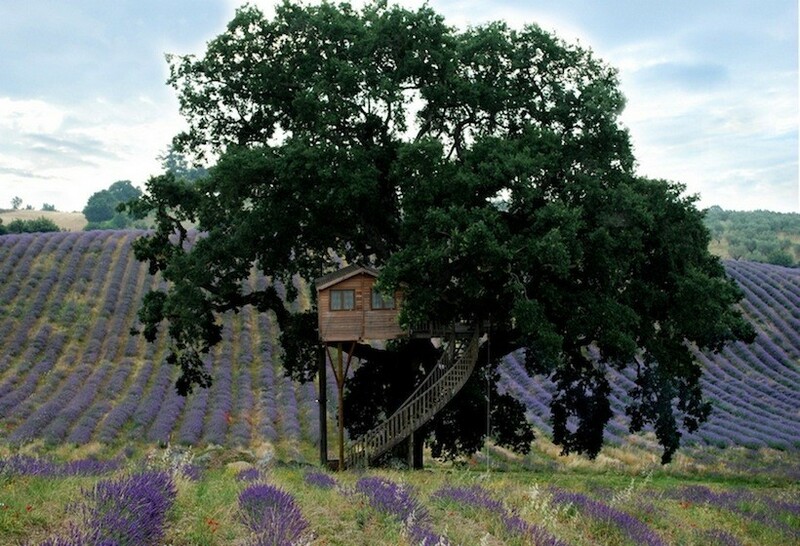 Book a stay at either treehouse between July 25th and August 10th and you’ll get to watch the lavender harvest from the windows. 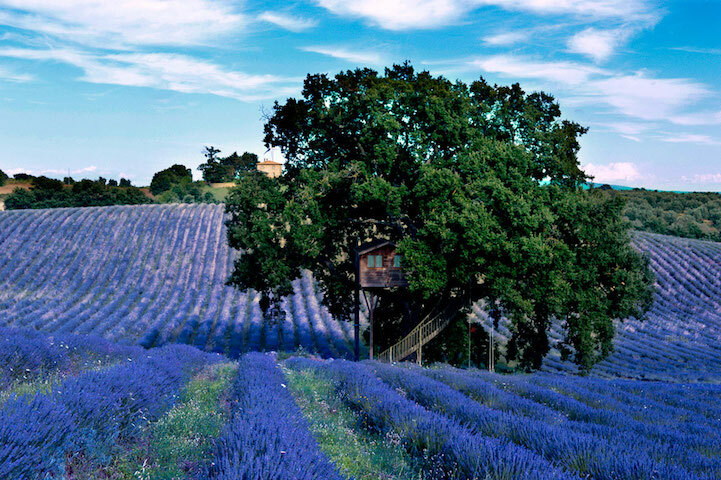 Commonly used as a calming therapeutic remedy, the scent of lavender certainly won’t hurt your goal of relaxation. The other rooms in the hotel, including four double bedrooms and three suites, are designed in Provençal style with botanical themes. 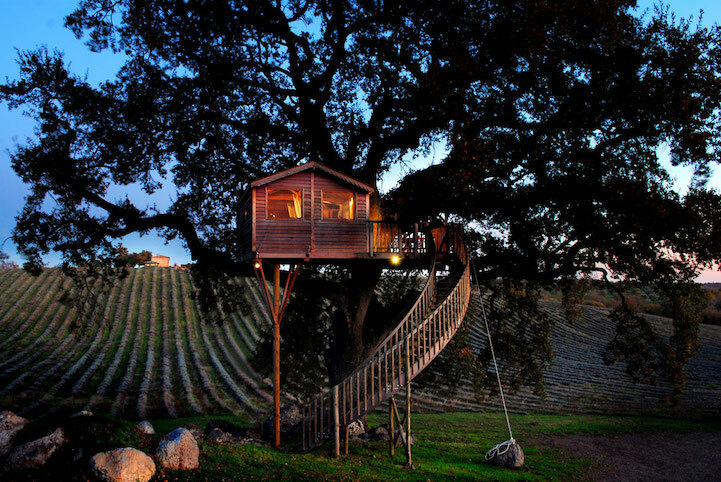 La Piantata is set in the heart of Tuscany in Arlena di Castro, about 50 miles northwest of Rome and 9 miles west of Viterbo. There’s certainly no shortage of beautiful sights to check out in the area, including the ancient Etruscan city of Tarquinia with its medieval city walls, vineyards and necropolises.